Led by Dr. Jeremy Mathis, PMEL teamed up with the University of Alaska and the Alaska Ocean Observing System this summer and early fall to use new unmanned tools to study how melting glaciers in Alaska’s Prince William Sound may be intensifying ocean acidification in the sound and on the Gulf of Alaska continental shelf. 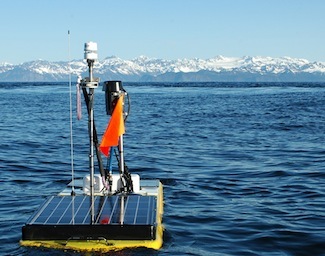 PMEL engineers outfitted two Carbon Wave Gliders and one underwater Slocum glider with sensors to help better understand the unique processes of glacial melt water and how they change the chemistry of the water column in Prince William Sound. To read more about this project please visit the NOAA Research News website.